Grabbed from deviantart.com, this piece of art has displayed some poetic sense, well, right on his very own skin! 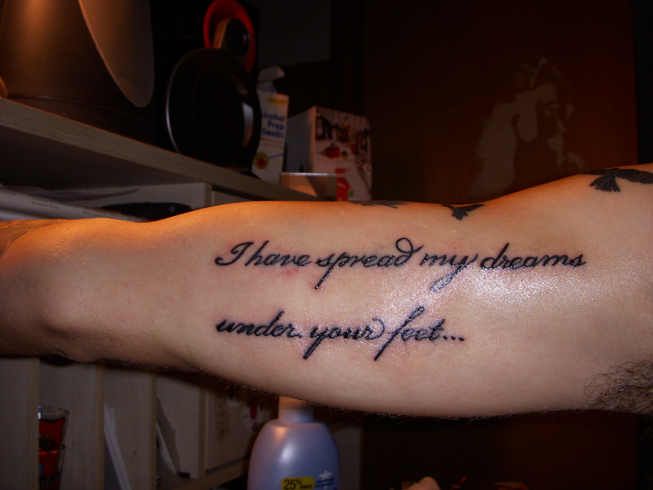 “I have spread my dreams under your feet”, this is a quote from William Yeats’ “He Wishes For the Cloths of Heaven”. If you still can’t get enough of poetry, then maybe you too need to browse your literature notes and get yourself tattooed right away. The tattoo is just so poetic so if you love tattoos and you love William Butler Yeats, then feel the poetic rush and customize your skin!